How many Japan prints do you want to order? ​Profits from the art sales of this image go towards the Japan ministry trip expenses. ​A Limited Edition of 300 Signed and Numbered 8x10 Fine Art Prints are featured. They are Museum Quality Professional Printed on 100% Cotton Rag Paper. Other sizes are available upon request. * The image was inspired when the artist was invited to accompany her friends, Charlie and Suzanne Tucker, of Tree of Life Ministry International, on a ministry trip to Japan. Constance and Suzanne both serve on the North Central Texas Area Board of Aglow International, and will be speaking at the Tokyo Aglow as well as other meetings while they are in Japan, April 5-18, 2017. * Profits from the art sales of this image go towards the Japan ministry trip expenses. Featuring a limited edition of 300 Signed and Numbered 8x10 Fine Art Prints. These are Museum Quality Professional Printed on 100% Cotton Rag Paper. Other sizes are available upon request. 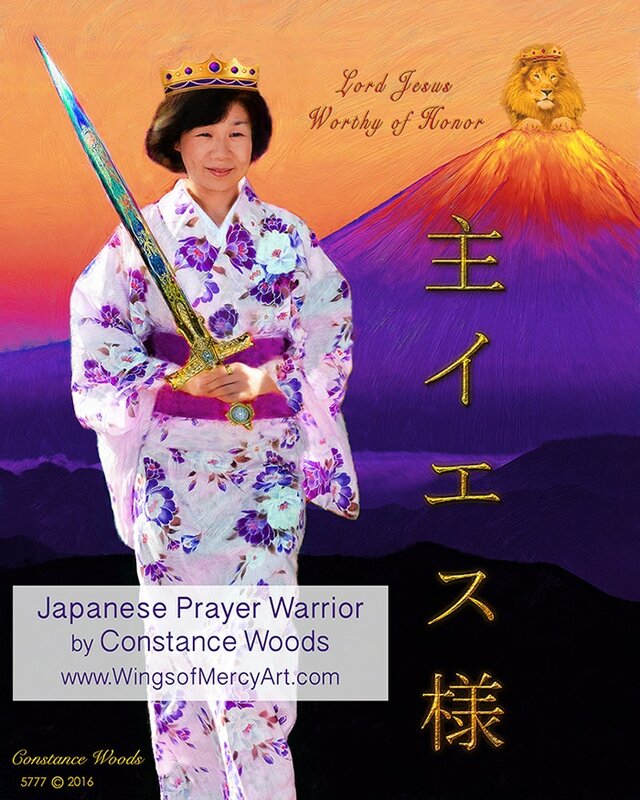 * This digital painting features Miyoko Urakawa, who beautifully represents the Japanese Warrior Bride of Christ. * Brenda Takano, President of the Tokyo Aglow, wrote both the Kanji message (Lord, Jesus, Honor) that was layered into the painting by the artist, and the prayer below. Please join in praying for Japan and for God to bring many souls from that nation into His Body. * PRAYER: “Father God, We join our hearts in unity to pray for the bride of Christ in Japan: That He would grant you, according to the riches of His glory, to be strengthened with might through His spirit in the inner man, that Christ may dwell in your hearts through faith; that you, being rooted and grounded in love, may be able to comprehend with all the saints, what is the width and length and depth and height, to know the love of Christ, which passes knowledge; that you may be filled with all the fullness of God (Ephesians 3:16-19). ​Army of the Lord of Hosts."